Guwahati, May 4 : The Ex-Mizo National Army Association (EMNAA), a body representing former rebels of the erstwhile armed group, Mizo National Front (MNF), is unhappy with the fact that even after 27 years of the signing of the Mizoram Accord which paved the way for peace in the state, criminal cases against three of its cadres have not been withdrawn. EMNAA treasurer, C Zama, said here on Monday that when the rebels surrendered, one of the commitments of the accord was the dropping of criminal cases. The three rebels are Lalzarliana, Lalbiakhluna and Vanlalhruaia. Zama said the cases were registered by the Manipur government under the Arms and Unlawful Activities (Prevention) Act. 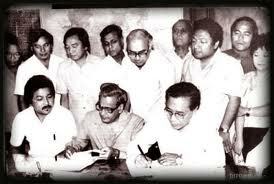 The accord was signed on June 30, 1986, between MNF chief Laldenga, Union home secretary, R D Pradhan, and Mizoram government chief secretary, Lalkhama. Rajiv Gandhi was then the prime minister. The MNF movement — which gathered currency in the Sixties after the Centre failed to address the problems of the people when a famine rocked the state in 1959 — came to a halt with the signing of the accord. "For several years, we have been writing to the Centre and even met several top officials in the Union government with our request but nothing has been done. We feel let down," said Zama. Last month, EMNAA leaders had talks with officials of the home ministry and also met leaders of opposition parties in the Capital. "We don't know what the Centre intends to do," said Zama. He pointed out that Mizoram was the only place in the country where air strikes were carried out in contrast to the present stand of not using the army in Maoist areas. "The Centre should be more sensitive towards the Mizo rebels against whom it used areal attacks. There was absolute peace after the accord. Now the Centre should keep its word," he stressed. However, most of the clauses of the accord have been implemented, many rebels have been rehabilitated, but a high court is yet to be set up in Mizoram. Incidentally, many women were raped during the peak of the movement. "The government is yet to rehabilitate them, too. Some of the survivors have become deranged," claimed Zama.